I have always loved Halloween. 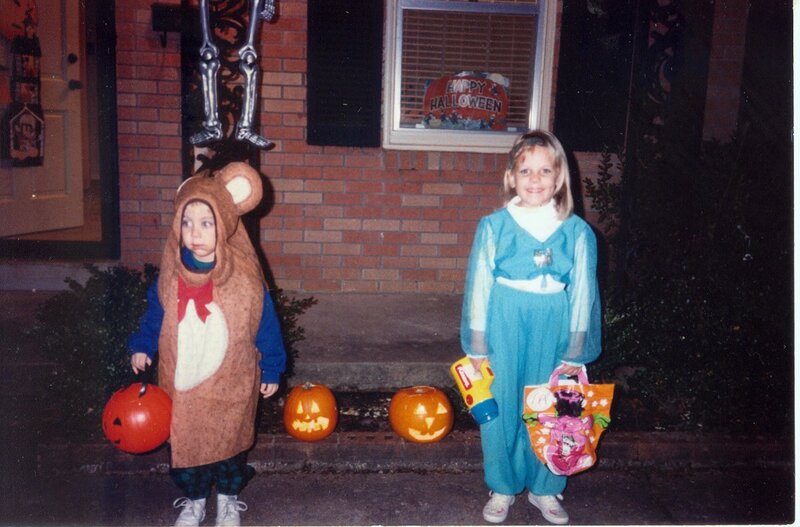 When I was a kid, I was all about going trick-or-treating with my brothers and a parent. Some of our neighbors made their houses spooky, but most just gave us candy. We would walk a couple of streets before coming home to sort, trade and eat what seemed like a mountain of candy. My brother Ryan and I sometime around 1993. Note the Fisher-Price flashlight. When we got older, we went to Halloween parties at our school where I loved the costume contest and avoided the haunted house like the plague. (While I may love the holiday, I also truly hate scary movies and being alone in the dark. What can I say? I’m a complicated individual.) Since we went to Catholic school, Halloween night also meant that we got to stay up late since there was never school the next day. I have always felt that All Saints’ Day is the most nicely placed of all holy days. My mom made me awesome costumes. One of the best parts of the lead up to Halloween was picking out a costume. It seemed to me like my mom could turn me into anything. 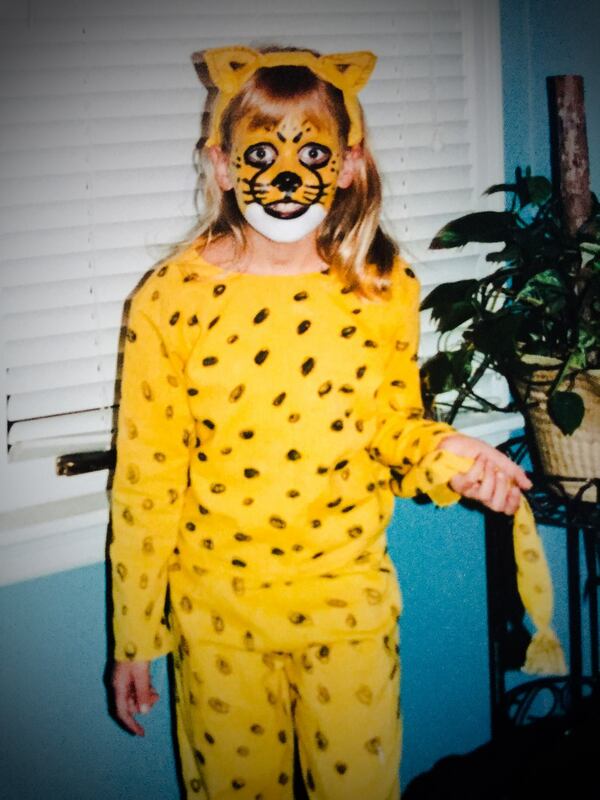 I went through a serious face painting phase for a while. I wish I could find a photo of my favorite year–the time my mom made me spring (the season). She sewed beanie babies and felt flowers onto green sweatpants, fluffy clouds onto a blue sweatshirt, and painted my face with clouds. These days I celebrate Halloween a bit differently. My love of covering my face in paint may have subsided, but that is not to suggest a lack of enthusiasm. Our house is decorated with skeletons and spiders and purple LED lights to make it welcoming for the many trick-or-treaters we receive. I have a skeleton menagerie that grows larger each year. Most importantly, I have the important responsibility of teaching my son about the joys of costumes. I think the reason I love Halloween is because it is pure fun. There are no gifts (other than copious amounts of small candy) to buy or big meals to cook. There is only the joy of pretending to be somebody else while knowing in everything will go back to normal in the morning. Next year, Noah gets to pick his own costume, and I will do my best to make it real for him. 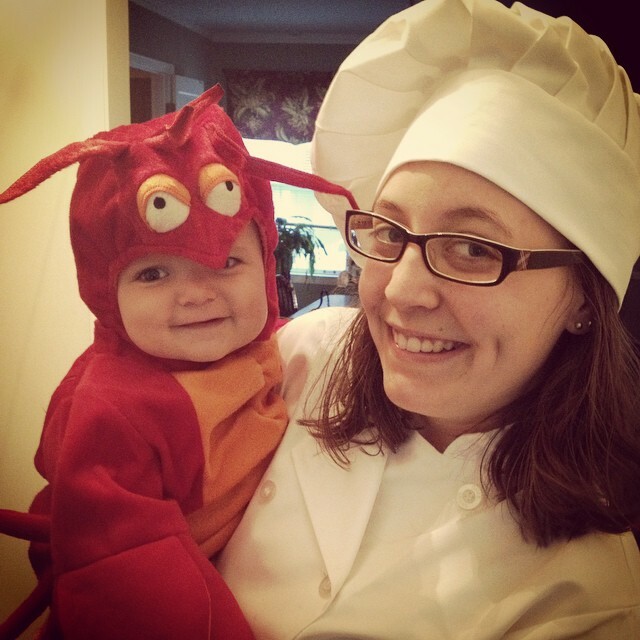 We’ll let his sister inherit the lobster. 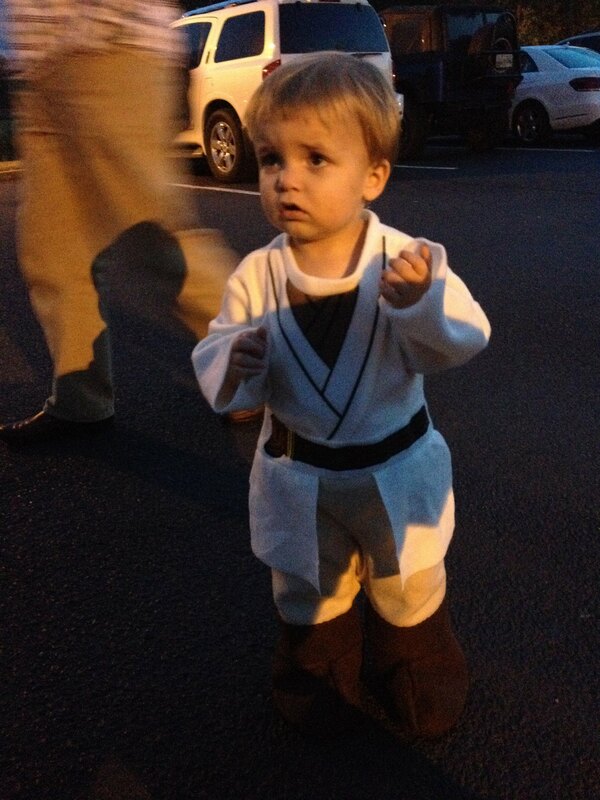 This year, though, I exercised my right to put my kid in whatever I wanted and made him Obi-wan K’Noah, the smallest of the Jedi.